There is an old saying ... "If I only knew what I know now ...."
I could have saved alot of money and maybe some time .... but where would the fun be in that. But in this instance it could have really helped. 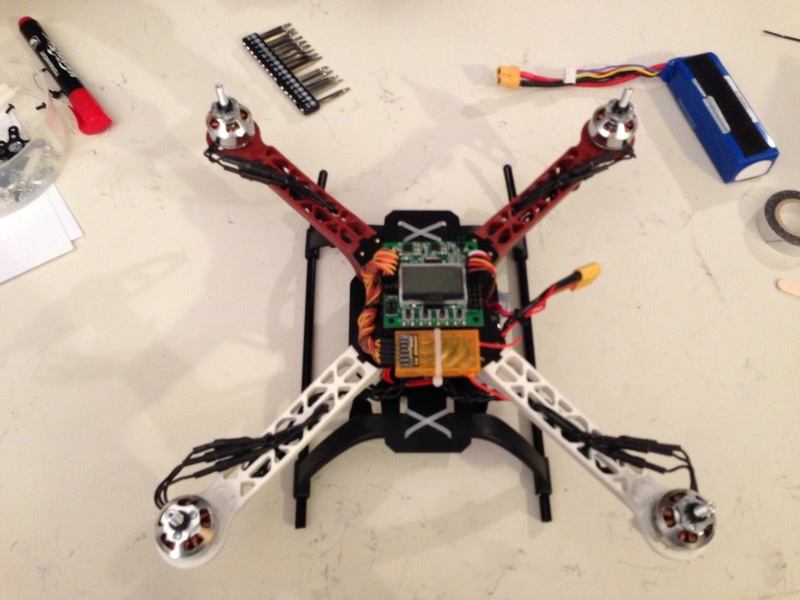 I started out this project wanting to get into aerial photography using a Quadcopter. I did a lot of reading and though I had a good plan. But after my many plans & failures, yes there were some successes I now believe that if I was to do it all again I would start with the build of a small 330 quad. My experience may be helpful for others who are also starting out. Now remember I had no RC experience before I started this adventure. Heres a list of "progress"
Plan E : HK330 "Current"
Unless you are an experienced flyer, you WILL crash, and if you are a novice like me you WILL CRASH A LOT. Use Dual Rates to help with the handling and stick sensitivity for novices likes me. Made a huge difference and helped with the learning to fly process. Dont try and run before learning to walk, I was planning on how I would FPV, yet still couldnt competently fly a quad. Dont think you will only buy one quad and be done, unless you get bored and move on. This is important to understand as then you can then get started cheaper, learn your skills and them upgrade. So after all my "learnings" I believe for me a starting with a 330 frame would have been a good start. As you can see Ive gone from large down to small. So this leads me to my current build Plan B. The home build 300mm quad I built was really good, surprisingly good. But if I crashed and damaged any of the motor mounts, which always hit first I would be with out a quad. So thats why I ordered parts for a 330 sized quad listed in the Plan D post. Eariler this week all the parts arrived ...... build time. Here is the HK 330 Frame compared to the RCTimer450 and my scratch build 300. The 330 sitting on the 300. Next steps was to take all the running gear of the home build and move over to the 330 frame. After a bite of fiddling the Q-Brain was a perfect fit in the 330 frame. 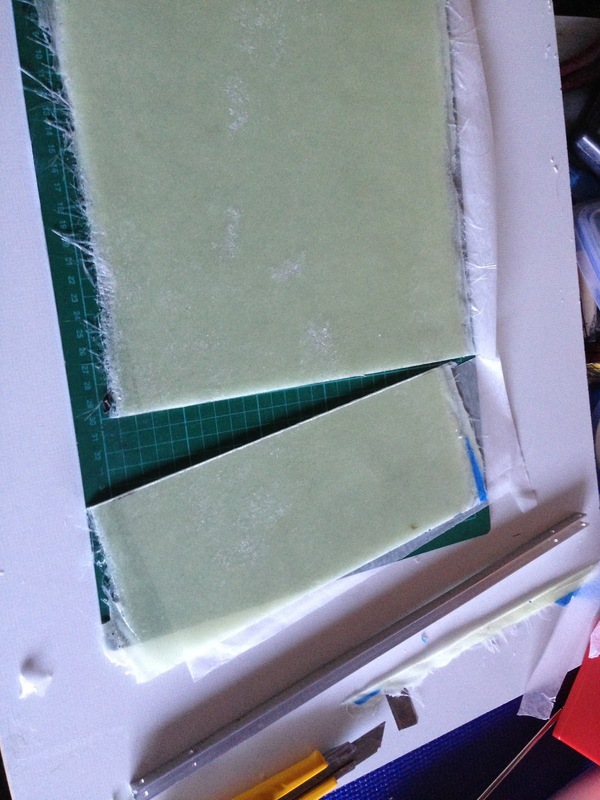 Once I got the orientation sorted I used double sided foam tape to hold it in place. Before I stuck the Q-Brain ESC into the frame I threaded through velcro straps and tested to make sure that they would hold the 2200 battery. 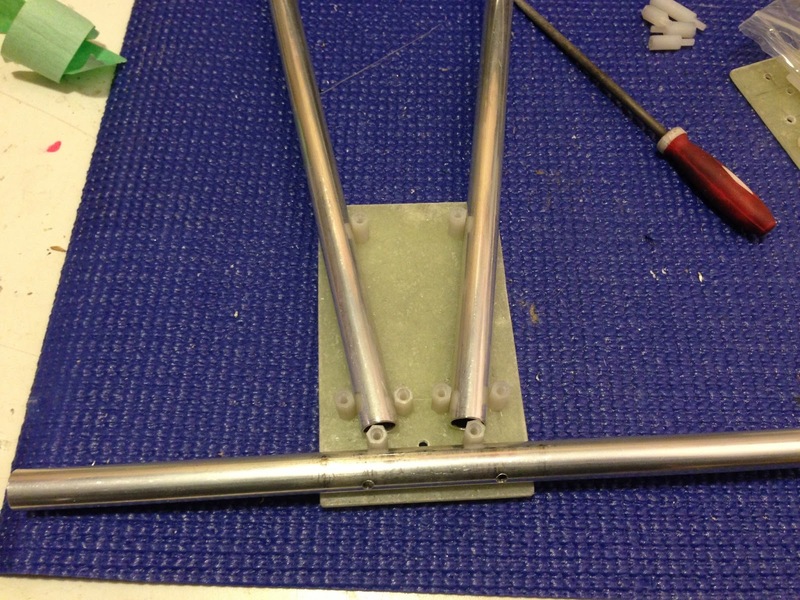 Q-Brain stuck in place and the leads routed ot the motors, Motors were bolted directly to the frame. With the long power leads on the Q-Brain ESC I platted them which reduced the length and then zip tied underneath the arms. I wanted this to be as tidy as possible. 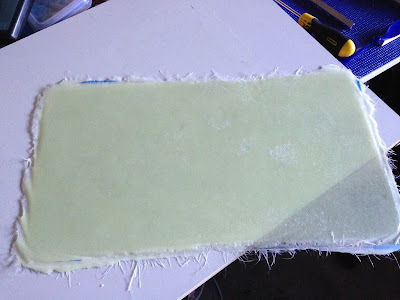 I transfered the foam plate I used to mount the KK2 board. Its made from the lid of the foam box that the kk2 was shipped in and the foam doubled sided taped to the frame. The KK2 board has sticky Velcro that is used to hold it to the match Velcro on the foam, Seems to work really well. The same velcro method was used for the receiver, plus an addition zip tie. I used zip ties to mount the helicopter 500 landing gear. The helicopter landing gear has been great at absorbing hard lands and crashes. After the first initial flight is seemed to have a surging motor. After more investigating I had a bent one of the prop adaptors very slightly, once I changed that and put a set of new props on with basic balancing (Blades, not hubs) it flew smoothly with out any surging. Next will be to do some fine tuning now I have sorted out the unbalance that was causing the surging. The next night I did some a little more tidy up of the wiring to secure the leads coming out of the motors were less exposed. Overall so far very happy and as I stated earlier this combo of frame, motor, ESC, KK2 and 8x4.5 props makes a great beginner quad. After watching this from the flitetest crew ... 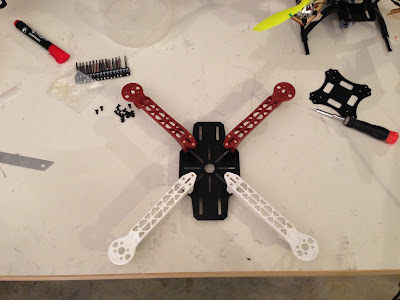 I really want a VTail Quad. I know ... I know I still cant really fly the two quads I have now .... But if I crash one I will still have 2 working quads ... right. Well thats my excuse and Im sticking to it, and I really like building things. After doing a good amount of searching I couldn't fit a good VTail build guide. So I just followed the rough rule of thumb to keep the distances from the props equal. I just laid it out on card. 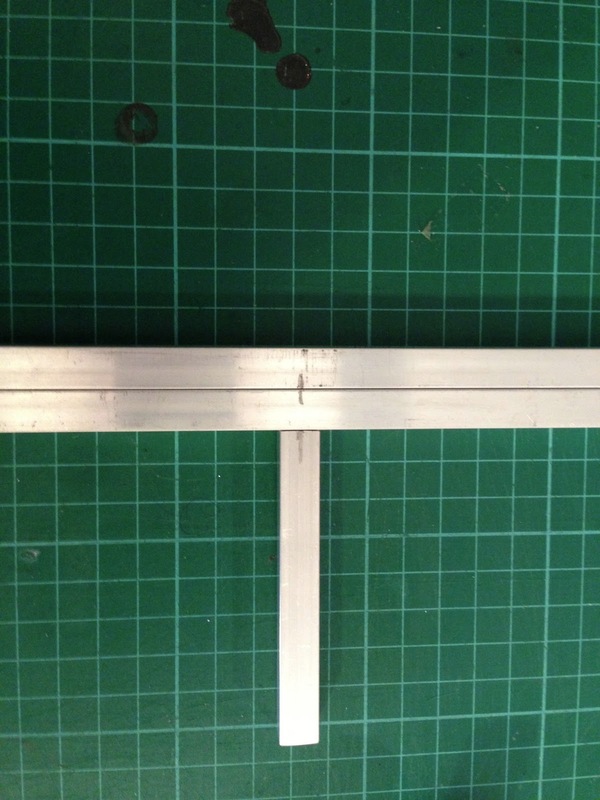 The first rough draw up was 350mm between the front props. The next day after some more thinking about it I reduced the size to 250mm between props on the front and I went for a straight bar to mount the front props and the V from there. 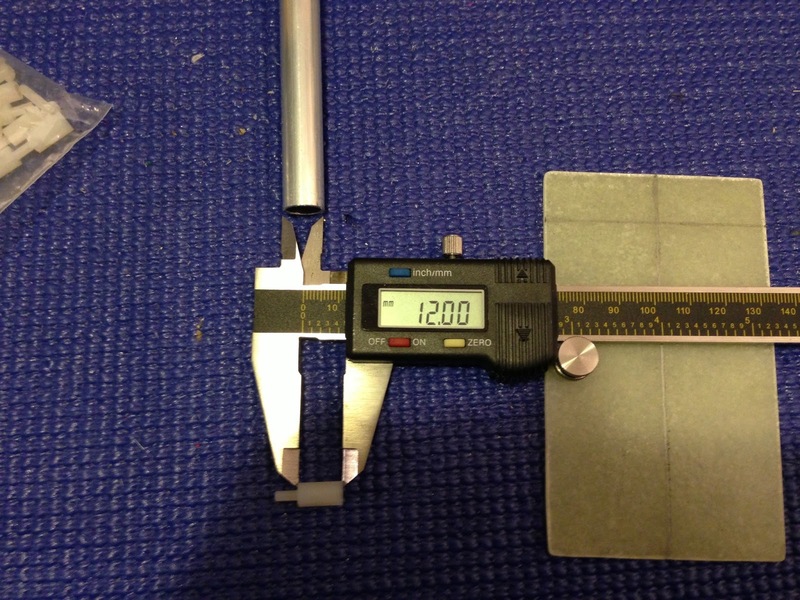 Based on a 45degree rear prop angle the distance between the rear mounts is 120mm. The below picture shows the rough frame design and proportions. This is using 8x4.5 SF props. I quickly bent a 10mm U tube to 45 degrees get an idea of the rear prop angle and to make sure that I got the clearance right. 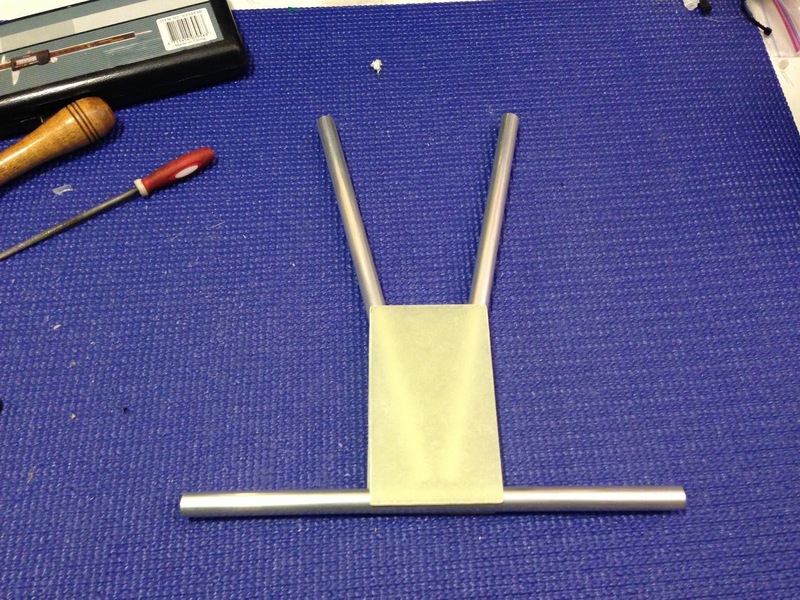 The next part of the design will be figuring out what to use for the plates to mount the booms to and how. I also made some short buzzers for the KK2 board. I just soldered the terminals from the buzzer directly to a JST female plug and then used some two part glue to hold everything in place. My 2 current quads, a RCtimer 450 frame and a home build 300 frame. I fly the 300 more as I get 10min flight time on a 2200, 3S. Looking forward adding the VTail to the mix. Well its now winter here and the day are short and the weather crap. Which means not alot of time to learn to fly out doors, and a novice flying a 450 indoors will end is expensive tears. So decided to make a smaller sized Quad. I finally got some 7x3.5 tri props, a Q-Brain ESC and some SK3 1275 motors from Hobbyking (3weeks shipping). 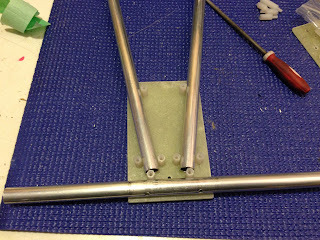 Next up was to make the frame, I decided to use 10mm U shaped extruded aluminum as its easy to get and easy to work with. I cut to length then measured the center so I could cut down 50% with the hack saw and then file out two slots on each frame so that I could then slot them together and have a flat x. First cuts made next was to use a small file to make them as wide as the side walls of the U shaped aluminum. After the cutting and filing the boom slotted nicely together. I drill a hole in the center and used a small 3mm bolt to hole then tightly in a perfect 90degree x, then used CA to help make sure there was no movement. I started to use this plastic container as a base and zip tied the booms to it and got it to flying stage before I changed direction and used the spare plates I had with the spare part Rctime 450 frame. I somehow while using the excellent eCalc I got the props , motor, weight combo wrong. So when the above quad was finished it took about 70-75% throttle to take off ..... guttered. i went back and checked my inputs and found that with all the permutations I was inputting I had used APC Slowfly for the prop details, once I used GWS which is what the props I got were ... it showed 66% for the estimated weight. So with is a little heavier 70-75% was what I ended up with. So back to the drawing board. So I ended up using the spare plates form the spare parts of the second RCtimer frame I purchased ... hey it was on sale and it was the cheapest what to get replacement arms, which I have already busted one of. 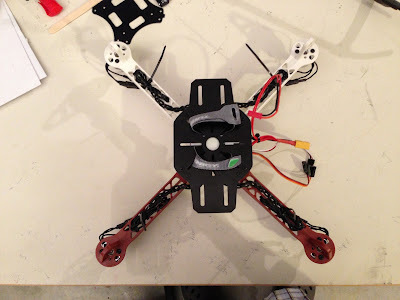 I zip tied my x frame with motor mounts on to the spare plate. 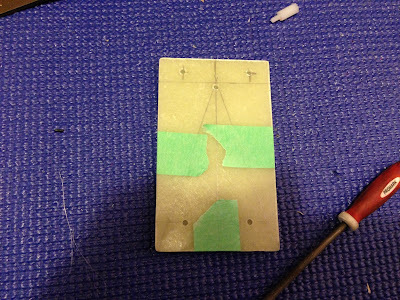 I then used double sided tape to mount the Q-Brain to the underside. All was looking great. However with the size of the Q-Brain and the need to put on the heli landing gear and battery I then decided to also add the other plate. I just used nylon stand offs. See I knew all that extra "stuff" I used to maximise shipping would come in handy. Using the 8x4.5 props was a tight fit, I had to slide the motor mounts out 5mm, but the fitted and it took off about about 45% throttle. I was much happier. 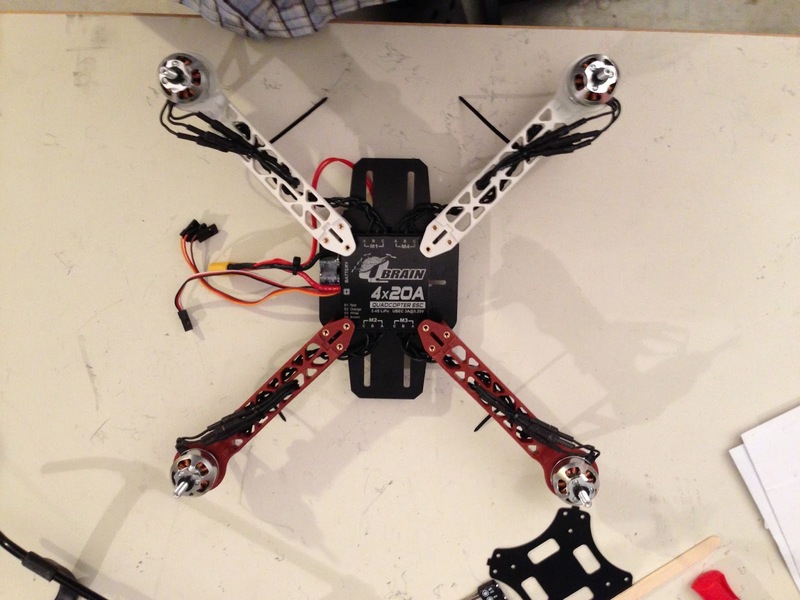 So I now have a smaller "indoor" quad. But I soon found out smaller means twitcher ... But its all good pratice. 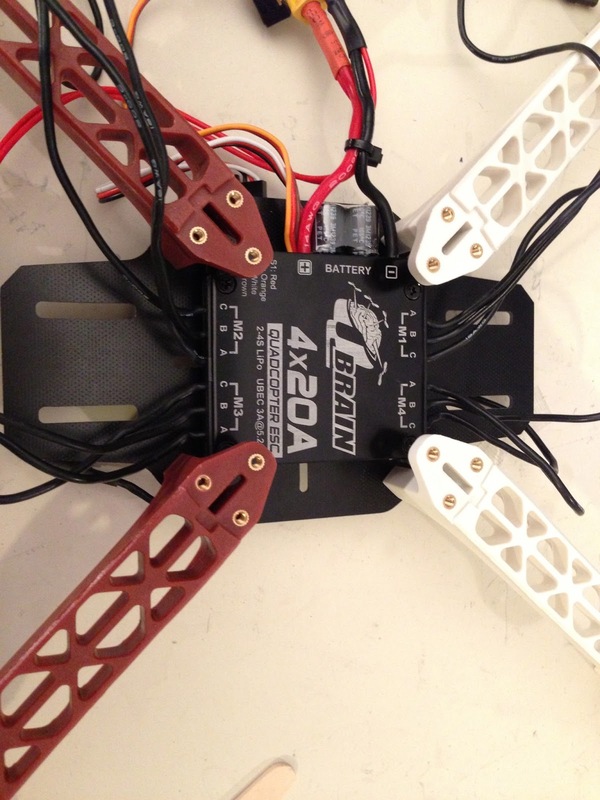 The small Quad on 450 for size comparison.